Designed for taking photos, videos, and live broadcasting with your smartphone, the black ES-01 Pocket Stabilizer from Sirui helps reduce shaking to avoid image blur. 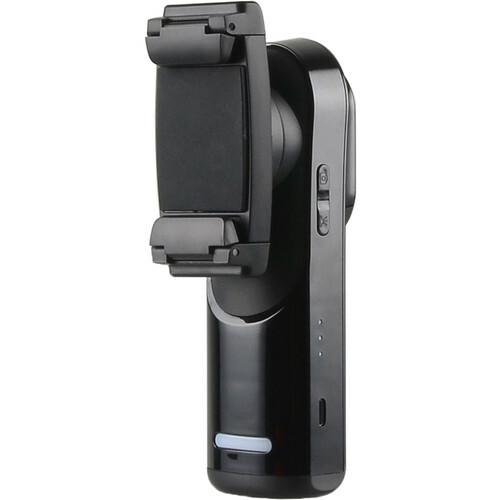 It can accommodate smartphones up to 5.5" wide with an external lens attached and uses Bluetooth connectivity to control your device's camera via a mobile shutter release. Additionally, an integrated fill light helps brighten selfie shots in dark environments, while a mirror helps to better frame and capture shots, even when using the rear lens of a dual camera system. The ES-01 is portable and can fit in your pocket and features a stability augmentation angle from 0 to 330° with an accuracy of 0.1°. It secures itself to your device using a built-in locking pin, its integrated 1000mAh battery lasts for around 2 hours, and recharges in 1.5 hours using an integrated micro-USB port. Do not force turn the mobile clamp 360°. This will cause damage to the stabilizer. The Sirui ES-01 Pocket Stabilizer is specially designed for taking photos, videos, or live broadcasting with smartphones. It can help to effectively reduce camera shake and the resulting image blur. It's also portable and can fit in your pocket. A strong engine is included for keeping the stabilizer stable, even when using a 5.5" smartphone and Sirui's 18-WA2 wide-angle lens. Sirui's Pocket Stabilizer can control your device's camera shutter release when paired via Bluetooth. A built-in fill light has three levels of brightness and its good illuminating selfie shots in dark environments. A wide mirror on the stabilizer helps capture portrait shots, even when using the rear lens. Properly Attach the mobile phone to the stabilizer as instructed. Note: Do not turn on the stabilizer before attaching the mobile phone and adjusting the balance of the attached phone, otherwise the working life of the stabilizer could be reduced. Horizontal adjustment - move the mobile phone to the left or right until it's horizontally balanced on the clamp. Vertical adjustment - move the mobile phone up or down until it's horizontally balanced on the clamp. Turn on the stabilizer after the steps above are completed. Note: When the stabilizer is on and the adjusted mobile phone can be balanced automatically, you can start to take photos or videos. Also, switching between landscape and portrait mode can be done by manually adjust the direction of the phone and holding it in place for 3 seconds. Box Dimensions (LxWxH) 6.6 x 3.2 x 2.5"